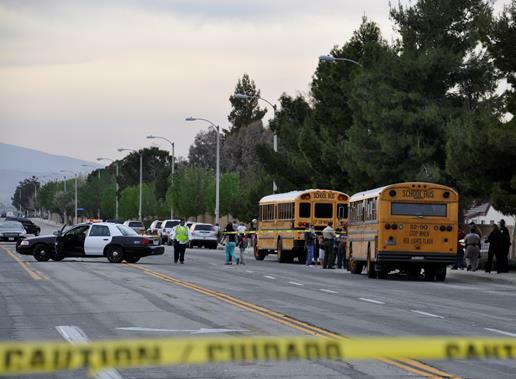 CHP investigators are searching for witnesses to a fatal school bus collision that happened on March 25. 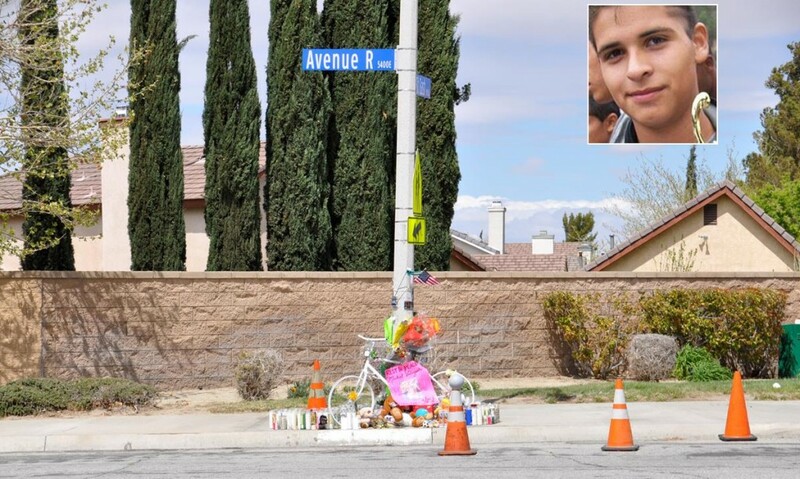 PALMDALE – Did you or anyone you know witness the school bus collision last week that claimed the life of 18-year-old bicyclist Michael Valenzuela? If so, the California Highway Patrol would like to hear from you. CHP investigators are requesting assistance from the public in identifying persons who might have witnessed the fatal collision, which happened around 3:54 p.m. on Monday, March 25 in the vicinity of Avenue R and 55th Street East. Investigators believe there were about six vehicles in the area at the time of the crash, and they are encouraging the drivers and occupants of those vehicles to contact the California Highway Patrol as soon as possible. If you were driving in the area or have contact information for a person or persons who were, contact CHP officers Wheeler or Howell at 661-948-8541. The incident happened at the intersection of Avenue R and 55th Street East. Valenzuela was riding his bicycle southbound on 55th Street East on his way to soccer practice when he was struck by school bus filled with students that was traveling westbound on Avenue R. Valenzuela died a short time later at the hospital. At the Palmdale City Council meeting Wednesday night, Palmdale Youth Soccer League representatives presented a petition with 1,855 signatures calling on the city to install a traffic light at the intersection of Avenue R and 55th Street East. City officials gave an outline Wednesday night of what is being done to install a traffic light at the deadly intersection. In April 2012, the city applied for a Federal Highway Safety Improvement grant to be used for the project, and they received the grant in October 2012 in the amount of $528,000, said Chuck Heffernan, Palmdale’s Assistant Director of Public Works. The city would provide an additional $110,000 to the project, Heffernan added. In January 2013, the Palmdale City Council approved the budget for the project; in February, the city received federal authorization to proceed; and in March, the city received authorization from Caltrans, Heffernan said. Several more steps needed to be completed to adhere to federal guidelines, including the design of the intersection, right of way acquisition and awarding the contract, which would put the project completion date around spring of 2014, Heffernan said. “We’ll do everything we can to expedite every phase of this and we hope to cut this down, but this is a realistic schedule at this time,” Heffernan said. In the meantime, the Palmdale Youth Soccer League is continuing its fundraisers to support the Valenzuela family. A second car wash fundraiser will be held from 8 a.m. to 4 p.m. Sunday, April 7 in the parking lot of Taco Bell at 37910 47th Street East in Palmdale. For more information on this fundraiser or what you can do to support to Valenzuela family, contact Kat Sanchez at 661-733-1973. To make a personal donation to the Valenzuela family, visit any Bank of America and ask to donate to the account of Juan and Michael Valenzuela. The account number is 325019314271. 8 comments for "CHP seeking witnesses in fatal school bus crash"
Due to the fundraising the family can say good bye to Michael and have services for him. The worst part the day of the car wash there was yet ANOTHER accident on ave r by 55th. This needs to stop! April 2014 is to far away to wait for a light!!! Put up stop signs something! Services for Michael will be held Friday 4-8 the viewing at Haley Olsen memorial on Palmdale blvd. services on Saturday are 1-4 at st Mary’s church in Palmdale. Dang!!! I feel like I’m being SCHOOLED UP IN HEAR!!! No ones YELLING!!! LOWER YO HEARING AID!! LMAO! DANG SMART PHONES ALWAYS CHANGING MY SPELLING!! BUT YU SHO DID KNOW WHAT I WUS SAYEN!!! I TAKE IT YU AIN’T GOT NOTHING BETTER TO DOO!! BUT I AGREE THAT THE BUS COMPANY SHOULD BE PAYING FOR ALL THE EXPENCES!!! Except for the obvious errors in spelling and grammer, I agree 100% with you. The bus company should not have to be asked to pay for the funeral costs. They should step up and do it. I’m sure they have insurance to cover those things. That bus driver should NOT HAVE BEEN SPEEDING. He was almost all the way across the treet and she hit him. shame on her. I’m sure she is tramatized…so what. HE IS DEAD. In these situations, it should be considered criminal if any witnesses drove away. Thank you av times for the continued coverage!! We couldn’t do a lot of this without you and all the other news outlets getting the word out!!! !